McCombie’s bill, House Bill 617, designed to help local governments receive tax dollars faster from the state. 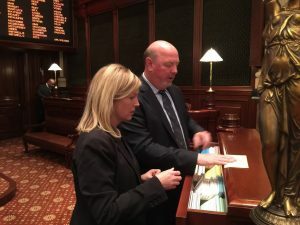 The legislation will establish a continuing appropriation for the State and Local Sales Tax Reform Fund, the Motor Fuel Tax Fund, the State Gaming Fund, the Local Government Video Gaming Distributive Fund, and the Statewide 9-1-1 Fund. HB 617 is currently in the House Rules Committee and is waiting to be assigned for consideration by a committee. The bill has twenty-two co-sponsors and broad bipartisan support.